Yesterday’s Apple Keynote at WWDC 2011 was full of big announcements. No shiny hardware upgrades this time, but a lot of great stuff coming up for our desktops with Mac OS X Lion, our mobile devices with iOS 5 and a solution to keep it all nicely synced together, iCloud. I’m still digesting all the new announcements, but here’s one particular feature of iOS 5 that I think could really be a huge hit in our classrooms: AirPlay Mirroring. 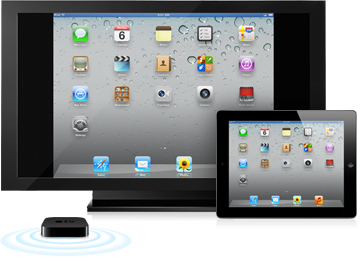 AirPlay Mirroring brings the ability to mirror your iPad screen through Apple TV. You can see a short demo in the video I’ve embedded below. Now, imagine this setting: instead of hooking your classroom overhead projector to the painfully slow computer on the teacher’s desk, connect it to the $99 Apple TV. And then use AirPlay Mirroring on your iPad to share presentations, your web browser or any of the 90,000 (!) beautiful apps for the iPad. And the best thing? You’re free to walk around the classroom and let your students interact with the apps. There are of course already several iPad apps that can help you turn your tablet into an inexpensive, portable interactive white board, but with this set up you could do so much more. It’s not limited to an app - you can do anything you can do on your iPad. Not to mention the setup is super portable, so you can take it along to any classroom you visit, not just at your own school. Unfortunately, AirPlay Mirroring isn’t out yet; it will be available in fall with the release of iOS 5. But I still think we’ll be seeing some nice uses of iPads hooked up to the not very expensive Apple TVs through AirPlay Mirroring. Bringing the magic of the iPad to the classrooms or meeting rooms, enabling people to work together just by passing the tablet around the room.